The TipTip is an odd little machine. About half the size of the Mignon, half the weight and half the quality, it appeared in 1936, two years after AEG had stopped production of the Mignon. Historic facts about the machine are sketchy. The designer of the TipTip was a German engineer called Franz Huebl. Apparently production took place first in Berlin and later in Czechoslovakia. 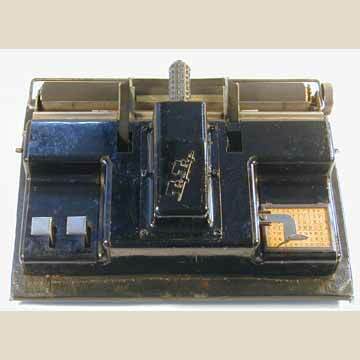 The TipTip was the first typewriter to be produced in Czechoslovakia. About 5,000 were said to have been produced. The first 500 machines are said by some to have been produced in grey, but this is widely disputed. Grey machines do exist, but may have been re-painted. The TipTip was not a very well-made machine. It is flimsy, with a very simple index card and cheap plating.